With your daughter’s wedding day coming up, you probably already have enough to think about. Certainly, you’ve probably already had your fair share of things to handle. So while you might not want to add another responsibility to your plate, you should consider giving a speech at the reception. Although this isn’t a traditional component, it’s something weddings are seeing more and more. If this sounds like something you’d be interested in doing, keep reading for an easy step by step process that will take out any extra effort. As the mother of the bride, your main focus should be, of course, on your daughter (just like most things having to do with the wedding). Although everyone will obviously know your relationship to her, take a moment to establish what exactly that means. The mother-daughter bond is an important one and now is a great time to establish that and even elaborate on it. Alright, some people can get nervous with this step. Very few people like public speaking and even fewer enjoy trying to tell jokes in such a situation. But wedding speeches can be laborious if there isn’t some humor mixed in to keep things interesting. Keep in mind that you’re surrounded by friends and family. So just about any story you tell (so long as it’s appropriate) will land with laughter. Just make sure it’s nothing that will overly-embarrass your daughter. Depending on your daughter, a little bit of embarrassment might be just fine. You can also tell a significant story that doesn’t have humor as a major theme. Is there a time you were especially proud of your daughter? Do you have a story that really sums her up? There might be something about your daughter you really admire that others just haven’t noticed before. All of these are options, but you should still consider a laugh or two along the way. Remember that it’s not just your daughter’s special day either. So make some time to focus on your new son-in-law. One popular option is talking about the first time you two met. Again, this is a great opportunity for a funny story. You can also talk about meeting his family for the first time. Expand on what they mean to you and how happy you are to know your daughter is now a part of their family. As the mother of the bride, you’re special for a number of reasons. One of the main ones, though, is that you’re one of only two people who can offer motherly advice. Take a moment to pass on any wisdom you may have. 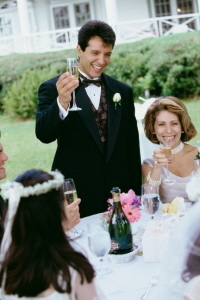 Any good wedding speech is followed by a toast, so remember to finish yours with one. Consider making the groom the subject of yours by welcoming him into the family. You can also do one to the happy couple, wishing them many years of marital bliss. 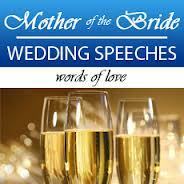 Category DIY Speeches | Tag mother of the bride speech | Bookmark the permalink.